It seems like everyone and their mother is on a tea-tox detox. The fad appeared on the scene at some point last year and now it's hard to for a day to go by without someone snapping a picture of their delivery of detox teabags riddled with promises of weight loss. Ultimately, the world has gone tea-tox crazy. 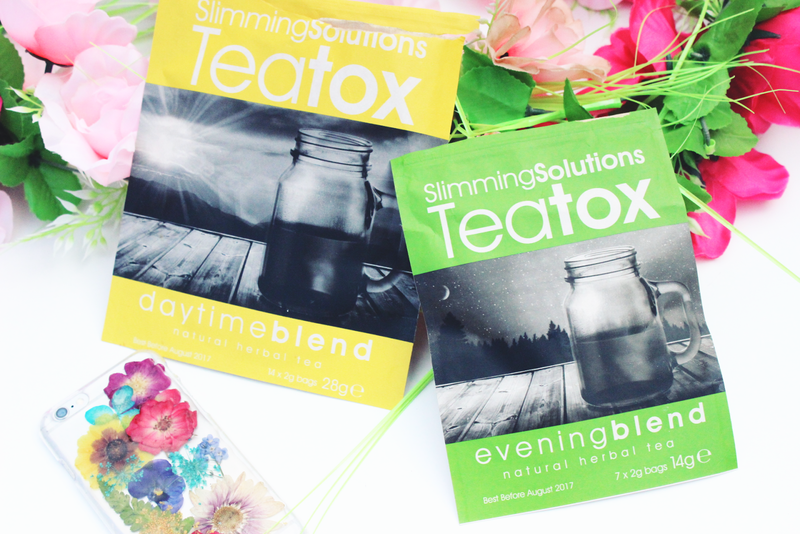 Wanting to see what all the fuss is about, I could not turn down an opportunity to try out a fortnight's supply of Slimming Solution's very own tea-tox. Also, I absolutely love herbal tea. I'll be honest, I didn't expect much from it. I was a tea-tox skeptic. Slimming Solution's tea-tox essentially works like every other tea-tox available out there. There are two types of tea bags: morning tea and evening tea. You are supplied with 14 morning tea bags and just 7 evening tea bags. The morning tea is supposed to be drank daily as soon as you wake up, whilst the evening tea is supposed to be consumed every other day. On the website it claims to remove unwanted toxins and burn fat from your body. My first impression of the tea was the overwhelming scent when I first opened the bag. Both the morning and evening blend are both reminiscent of liquorice and I HATE liquorice! The scent automatically put me off, however I simply added a fresh slice of lemon in the hope it would disguise the taste. I cannot comment on the taste of the blend without the added lemon as I haven't tried it, but when you read up on other reviews I think it's safe to say it's a taste you would have to train yourself to get used to, just like with standard green tea or raw matcha tea. However, with a lemon slice popped in I have to say I rather enjoyed the taste of it, but then I am a regular herbal tea drinker. Now there's a lot of talk and worry about the tea-tox evening blends due to their laxative effects. Essentially, this laxative effect is the toxins being flushed from your body (TMI, soz). I can't say I noticed any particular excessive laxative effect, but then again I suffer pretty severely with IBS (TMI x2), which essentially means my digestive system is a royal mess and refuses to digest most things. I have a combined case of IBS, which means if I'm I flit between either 'going' all the time or 'not going' at all. Basically, it's a real pain in the arse (PUN DEFINITELY INTENDED). HOWEVER... I did notice the tea-tox had a tremendous effect on reducing bloating, which is something I suffer with on a daily basis. It is the bane of my life. I wake up absolutely fine, then I take one bite of granola and BOOM! Like an allergic reaction my stomach inflates like a balloon. I'm constantly questioning whether food baby or real baby on a daily basis whilst grimacing at my protruding stomach. I've got to confess, I didn't follow this tea-tox plan as strict as you're supposed too. I would always have my morning coffee before my morning blend and I kept forgetting it on some days. I managed a good 7-day streak at one point and although at first I wasn't convinced by the tea-tox fad, my mind has now well and truly been swayed. Despite not adhering to a strict routine, I still found it made such a difference with my daily bloating that it's worth it for that alone! Also, I found during my 7-day streak my skin cleared up rather nicely. The only downfall with tea-toxes is the price as they usually retail around £30-40 for a month's supply. However, Slimming Solutions are running a BOGOF throughout the whole of April so you can get a month's supply for just £19.99. You can purchase the tea-tox here. 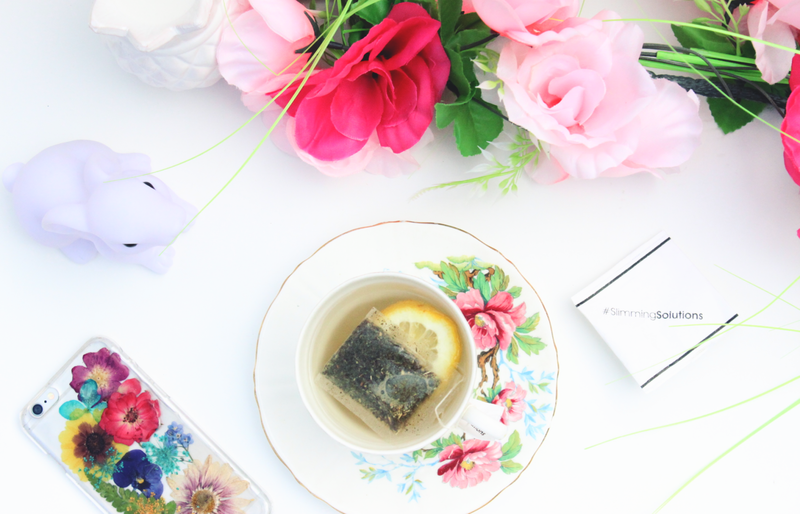 Have you tried a tea-tox before? What were your results? 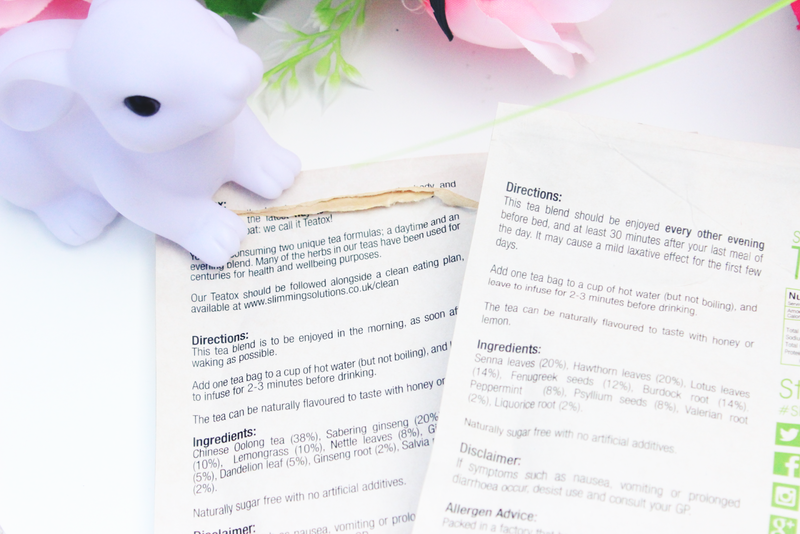 Funny thing is I just did a review of the Bootea teatox on my own blog ha ! But I can read also on your box that your teatox had laxative effects too. Mmh not sure that's for me then.